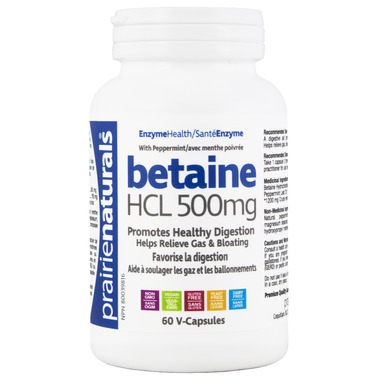 Prairie Naturals Betaine HCL helps to increase stomach acid and improve digestion. Directions: Take 1-3 v-capsules at the start of each meal. Consult doctor if you are breastfeeding or pregnant or if you have a peptic ulcer disease or taking asprine or asprin containing compounds or anti- inflammatory drugs. I was unable to use this because the peppermint was so prominent and caused acid reflux instead of decreasing it.